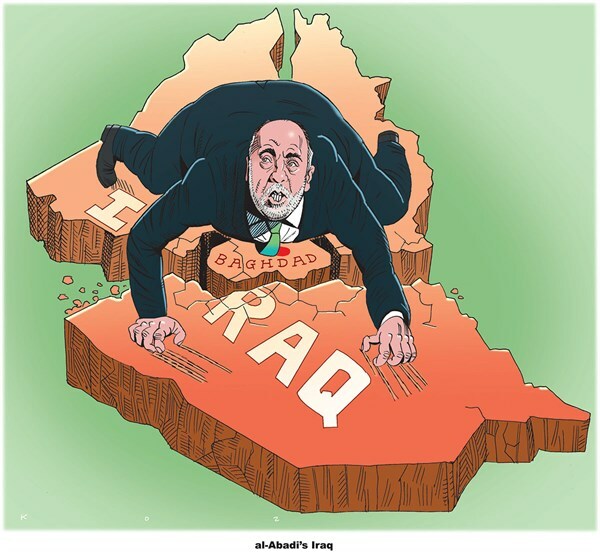 Tempos Interessantes: "My Country Needs More Help From the U.S."
Iraq cracking and Al Abadi struggling. Iraqis standing together against the cruelest killers on Earth. (…) build an Iraq worthy of what we are: a pluralist people, steeped in history, striving to build one nation in peace and mutual respect. We must reconcile our society across sectarian and ethnic lines. (…) preserving our sovereignty and ensuring that no neighbor exercises outsize influence within our country. The part about “Iraqis standing together” is really questionable and the same goes for “mutual respect”. Reconciling sects and ethnicities is almost a utopia and sovereignty preservation is denied by the facts on the ground and by the Premier’s own plea for full US engagement. We see the Yazidis, formerly persecuted and killed by the Islamic States (IS) now being persecuted and killed by the Kurdish Regional Government’s (KRG) peshmerga. We see the increasingly autocratic and thuggish KRG trying to take control of disputed territories and to get a foothold on traditional Sunni land, such as Mosul. We see the blood-thirsty Shiite militias always angling for retribution killings of Sunni civilians. We see the Iraqi government in Baghdad at loggerheads with the regional government in Arbil which, in turn, is increasingly beholden to Turkey. And we do not see, at least not yet, the Sunnis fully embracing the hedonistic new order proclaimed by Abadi. * Turkey and Iran vying for influence, power and presence in Northern Iraq. * An increasingly Ankara-dependent Kurdistan Regional Government fighting Iraq’s central government. * A multi-faceted Shia political and security establishment striving to keep and apportion power and perks. * A creepy Al Maliki lurking and planning a comeback. And, facing this scenario and looking at precedent, I regard a full-fledged Sunni integration into the political, security and economic mainstream with deep skepticism. O ye of little faith, I might say to myself. P.S. All of Abadi’s writing, focus on a single ultimate goal: to present an appealing way forward for Iraq in order to ask Americans to assist us as we restore our infrastructure and diversity and partially privatize our economy. We need U.S. investment to rebuild our housing, hospitals, schools, sanitation facilities, roads, highways and bridges. We can also benefit from Americans’ technical expertise as we improve and expand our telecommunications, information technology and health-care sectors. Iraq needs U.S. financiers and corporate partners to help us develop agriculture, petrochemicals and other industries. So, he wants Washington to pay for Iraq’s reconstruction across the board, far exceeding the scope of Donald Trump’s infrastructure investments for his own country. Asking Trump to splurge money in Iraq, where the main players range from skeptical to outright hostile towards America is a very, very long shot indeed.